We’d love your help. Let us know what’s wrong with this preview of Reap the Whirlwind by David Mack. The mystery of the Taurus Reach is about to be revealed.Ancient secrets lie on the fourth planet of the Jinoteur system, and three great rivals are fighting to control it. The Federation and the Klingon Empire want to wield its power; the Tholian Assembly wants to bury it. But the threat stirring on that distant world is more dangerous than they realize. The Shedai, who rul The mystery of the Taurus Reach is about to be revealed.Ancient secrets lie on the fourth planet of the Jinoteur system, and three great rivals are fighting to control it. The Federation and the Klingon Empire want to wield its power; the Tholian Assembly wants to bury it. To ask other readers questions about Reap the Whirlwind, please sign up. For those who may have missed earlier reviews of the previous novels: Vanguard is a Federation starbase in the Taurus Reach, a region of space between the UFP, the Klingons and the Tholians. Several years before the opening of the initial volume – Harbinger Star Trek Vanguard 1 – Starfleet discovered what it calls the meta-genome, clear evidence of an incredibly advanced race that had once dominated the region. Und Reap the Whirlwind is the third book in the Vanguard series of “Star Trek” novels. The more books by David Mack I read, the more I believe that he is the number one Star Trek writer out there at the moment. Having written one of the most meaningful stories of the Star Trek Universe (the Destiny trilogy) and having made contributions to numerous other Star Trek series, he is, in my opinion, the author who manages to best capture the Star Trek atmosphere. When reading his books I am totally immersed in the story and location. Totally involved in the character progression. Reap t The more books by David Mack I read, the more I believe that he is the number one Star Trek writer out there at the moment. Having written one of the most meaningful stories of the Star Trek Universe (the Destiny trilogy) and having made contributions to numerous other Star Trek series, he is, in my opinion, the author who manages to best capture the Star Trek atmosphere. When reading his books I am totally immersed in the story and location. Totally involved in the character progression. Reap the Whirlwind is again one of those books. Having written the opening book of the Vanguard series (Harbinger), David Mack returns with the third book. And what a book it is. Packed with action, exploration, character development. The way he portrayed the Shedai race reminded me of the Caeliar in Destiny. In his skilful hands the Shedai became more than an instrument of destruction carrying the plot forward, they became a collective character in the story, as they should have been. Outstanding & best so far of the Vanguard series! In this book, several open story threads introduced in the first and second volume finally collapse and get resolved. It might not be the resolution you were hoping for but for me it made it a far more interesting read than the previous book of the series. It was really good to see a supporting cast as Quin take a more frontline role, and the way that made him evolve was great. Several other characters went through very defining moments in this book, so this makes it a must read, as it changes t In this book, several open story threads introduced in the first and second volume finally collapse and get resolved. It might not be the resolution you were hoping for but for me it made it a far more interesting read than the previous book of the series. Several other characters went through very defining moments in this book, so this makes it a must read, as it changes the status quo quite greatly. An excellent conclusion to the first act of VANGUARD, this exciting novel brings the events set up in books 1 and 2 to a satisfying climax, while setting up plenty of conflict and mystery for the second half of the series. Vanguard #3 is another good effort. David is one of my favorite authors. Looking forward to Vanguard #4. A court martial to conduct. Easily the best yet of this spectacular series. This story was relentless, never letting you catch your breath. A real page turner. Best of the series so far. “Reap The Whirlwind” by David Mack is the 3rd novel in the Star Trek Vanguard series and it really highlights how these novels are getting better and better. The novel is full of engaging philosophical and moral dilemmas set amongst a thoroughly engrossing and enjoyable space adventure. Simply put, I believe this novel and the series in general is proving to be Star Trek at its very best. The story itself picks up several weeks after the events of the previous novel, “Summon The Thunder”. The anc “Reap The Whirlwind” by David Mack is the 3rd novel in the Star Trek Vanguard series and it really highlights how these novels are getting better and better. The novel is full of engaging philosophical and moral dilemmas set amongst a thoroughly engrossing and enjoyable space adventure. Simply put, I believe this novel and the series in general is proving to be Star Trek at its very best. The story itself picks up several weeks after the events of the previous novel, “Summon The Thunder”. The ancient and powerful alien race known as The Shedai continue to awaken throughout the Taurus Reach and are continuing to threaten the various Federation colonies that have spread across the region. The crew of Starbase 47 and its various support ships continue to try and protect these colonies from both the Shedai and the Klingons with whom tensions have continued to rise. However, trying to keep the information on the Shedai a secret is proving a strain, especially when one of the leaders of these new colonies turns out to be Commodore Reyes’ ex-wife. Mack has really ratcheted up the tension in this book which helps to turn the book into a addictive page turner as the reader. This tension is expertly released via various exciting action sequences that don’t pull any punches as the body count continues to rise due to the dangers of the Taurus Reach. All of this is supported by some really wonderful characters that continue to grow as they face various challenges, both personally as an individual and professionally as a member of Starfleet etc. I now really feel for these characters and can’t help but feel for them as they are forced to face the wide ranging consequences that have resulted from their actions in both this and previous books. What I also have enjoyed about the book is that Mack has continued to try and give the reader differing viewpoints to that of our usual Federation heroes. We get to see things from the view of the Klingons, Tholians and now even the Shedai themselves which provides so many interesting layers to the story. Seeing things from the Shedai’s position in particular was a clever move as it manages to give this potentially super powerful enemy a real face that the reader can try and understand and opens up future avenues to explore in greater detail as the series progresses. I have finally come to the conclusion that none of the Vanguard novels are going to have any real standalone stories that would make me recommend the book as an individual read. Yes, there are two superbly enjoyable central plots to this novel, the first being around the colony being set up by Commodore Reyes wife and the scouting mission being undertaken by the USS Sagittarius but neither of them would mean much to a reader who doesn’t know the overall storyline. Basically, if you haven’t read the previous book in the series and/or don’t plan to read the next ones then I wouldn’t waste your time picking this novel up. Overall, this is another fun and entertaining book in the Vanguard series which now has me well and truly hooked. If you have enjoyed the previous books then you are really going to be thrilled by this book. After reading the first two Vanguard novels I came away feeling very underwhelmed. The plot was intriguing and the characters had promise but there was far too much set up, too many characters to keep up with and too much padding. This story changed everything. The plot was thrilling and kept me hooked throughout with lots of twists and turns that had me saying to myself "just one more chapter" despite the fact it was 2 in the morning. The characters whilst still too many to k Well... What a ride. This story changed everything. The plot was thrilling and kept me hooked throughout with lots of twists and turns that had me saying to myself "just one more chapter" despite the fact it was 2 in the morning. The characters whilst still too many to keep track of in some respects were far more fleshed out and I felt for them and they plights, especially Reyes and surprisingly Quinn and Pennington. The story as a whole mostly wrapped up a lot of the plot points raising in the first two books whilst setting up new mysteries and story lines that will presumably fuel the other 5 novels left in the series. I just finished reading Reap the Whirlwind, the third book in the Star Trek Series Vanguard. I know, it's not current news and the book is seven years old now, but I just read it and I think it's worth sharing. Vanguard focuses on events surrounding the Taurus Reach, a mostly unexplored region of space between the borders of the Federation, the Klingon Empire, and the Tholian Assembly. The series is named for Starbase 47, Vanguard, where a lot of the story takes place. 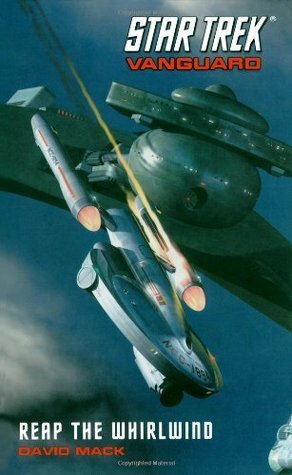 The Federation moved into I just finished reading Reap the Whirlwind, the third book in the Star Trek Series Vanguard. I know, it's not current news and the book is seven years old now, but I just read it and I think it's worth sharing. Vanguard focuses on events surrounding the Taurus Reach, a mostly unexplored region of space between the borders of the Federation, the Klingon Empire, and the Tholian Assembly. The series is named for Starbase 47, Vanguard, where a lot of the story takes place. The Federation moved into the Taurus Reach in order to study the Taurus Meta-Genome, an incredibly complex genetic structure that seems to hold the key to much more than a specie's genetic material. The Klingon's are trying to discover what the Federation is after and the Tholians are trying very hard to keep both parties out. The reasons why become clear when the Shedai, an ancient collection of beings that can shed their physical bodies and have godlike powers, come back from their eons long self-induced hibernation and try to use the Tholians as the slaves they once were inside the Shedais' machines. Reap the Whirlwind continues the plot lines set down in the previous two books and has the Federation making it to the Jinoteur system, the seeming source of the Shedais' power. The middle of the book is full of explosive action and I found it difficult to stop reading at that point. There is great character development in this story, and the story and characters are pretty deep for a Star Trek novel. This is certainly a long way from the original Star Trek books. It has a good mix of action, political intrigue, legal drama, and real stories of human interaction. By the end of part two, the story seems to be done. The third part, while very interesting, feels like an extended epilogue. Each of the chapters wraps up the hanging plot lines, of which there are many. Some of these later chapters leave obvious places for the fourth book in the series to pick up, while others neatly tie up a sub plot. Reap the Whirlwind nicely wraps up the first story arc, while setting the series up for a refreshing new start. I get that people usually write about new or upcoming releases, and this book is pretty old, but I really enjoyed reading it. Being a few years old doesn't mean a book is worthless, or that everyone that would enjoy it has read it, so I hope a few people out there are inspired to start reading the Vanguard series. It is a very well written set of books with a very deep set of plot lines. If you've never read a Star Trek book before, this would be a great place to start. It is separate from the events in the main novel arcs and the TV series, and it would be great on its own, even if you took all the Star Trek jargon out of it. It's sort of weird when you get near the end of a story and realize that there's nearly another whole book to be read. Not a bad thing exactly, but it was a bit distracting, because after about page 351 the story truly seemed concluded to me, and concluded well. But, you read what is on the page and so I kept going and it was a good little extra novella after the first part, though not as very exciting as the first part of the book. Mack is a very good author when it comes to weaving all these n It's sort of weird when you get near the end of a story and realize that there's nearly another whole book to be read. Not a bad thing exactly, but it was a bit distracting, because after about page 351 the story truly seemed concluded to me, and concluded well. But, you read what is on the page and so I kept going and it was a good little extra novella after the first part, though not as very exciting as the first part of the book. Mack is a very good author when it comes to weaving all these new characters (and life forms) with the established canon of Star Trek (of which there seemed to be more in this book than the previous two). The third book in the Vanguard series is full of interesting twists and turns and is most definitely the most exciting instalment so far. It's hard to say too much without spoiling it, but at times its funny, one character makes a MacGyver type escape and revelations abound. It has pretty much everything you'd want from Star Trek even though there is only one character from the screen in it (that I know of) and thats Commander Terrell who'd be a captain in Wrath of Khan. Everytime I read his sec The third book in the Vanguard series is full of interesting twists and turns and is most definitely the most exciting instalment so far. It's hard to say too much without spoiling it, but at times its funny, one character makes a MacGyver type escape and revelations abound. It has pretty much everything you'd want from Star Trek even though there is only one character from the screen in it (that I know of) and thats Commander Terrell who'd be a captain in Wrath of Khan. Everytime I read his sections my heart breaks. We all know how his story ends. The third book in the Vanguard series is by far the best, and surprise, surprise, it is written by David Mack, the progenitor of this series. All I can say is WOW...from the amazing adventure on Jinoteur IV, to the horrific command for General Order 24 on Gamma Tauri IV, to the introduction of Dr. Carol Marcus into the storyline, tying Vanguard to the events of later Star Trek movies, this book is just WOW. A MUST READ, and by far the best in the Vanguard series. I was going to give this 2 stars, but it partially redeemed itself in the last 50 or so pages. Now I'm not totally dreading continuing the series. It continues doing a fine job of expanding the TOS era of Star Trek, which I really appreciate. However, it was far too scatterbrained with all the different characters and plot threads that never quite come together. This might just be an issue with being a middle book in a series, but I guess I've come to expect a little more. This book in the series became a bit more dark. You do not often think of Star Trek with many people getting hurt or killed - not the case here. The folks from the Vanguard station run up against beings that are vastly superior in their powers. Decisions are made to sacrifice some for the "greater good" and legality often out weighs humanity. David Mack write well and the characters are done well. This is as story with difficult results but still in the TOS universe and time frame. I'm hard-pressed to find a problem with this novel. I am a very lenient and forgiving person, so take this with a grain of salt, but I feel compelled to give Star Trek Vanguard: Reap the Whirlwind a 10/10. Wrapping up all the plots introduced in the series, the book is a brilliant example of Star Trek Universe's diversity and David Mack's dexterity in writing for the franchise. This would have been a good ending of the book series. But since there are 6 more books to come I am really excited to see what will happen next. Better than the previous two titles in the series. More action and story arcs pretty much resolved. No surprises in the end does make the series a bit of a downer.